This Stornoway-based Bed and Breakfast establishment is modern, light and spacious. Situated on a quiet leafy residential street, close to the main bus routes. Stornoway town centre is only a short 15min walk away. 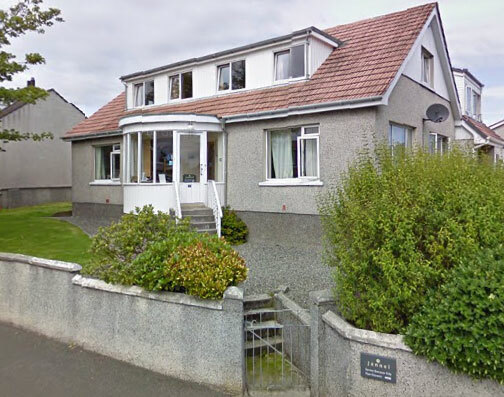 The Guest House is located less than five minutes’ drive of the ferry terminal, and is within easy reach of Stornoway Airport. The accommodation consists of 5 guestrooms over 2 floors, with twin, double and super-king bedded rooms, all with en-suite bathroom facilities, central heating, flat screen televisions, hairdryers, alarm clocks and an in-room tray service with great-tasting Fair Trade tea, coffee and hot chocolate. Free Wi-Fi and Free Parking is available to all guests.